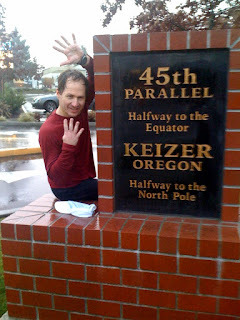 I left Corvallis' Riverfront Park at exactly 7:42 AM on Sunday, December 20th, the shortest day of the year, headed for Keizer 45 pesky miles away. 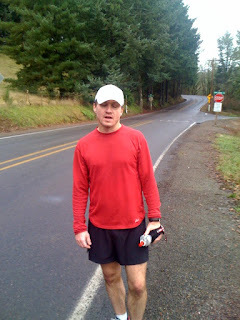 It was warmer than expected and I was able to start in shorts and a long sleeve shirt. I crossed over the Willamette for 3 miles on hwy 34. I turned North on Riverside drive with the knowledge that I stayed on Riverside until it tgurned into Queen Ave in Albany. About a mile up Riverside I came to a road with a sign that if I followed it, would have me turn right. That didn't seem right but I followed it. That's a weird way to run, thinking you're going the wrong way, not a lot of conviction in your legs. I had my iPhone in my waist belt for emergencies and it had my map on Mapmyrun. I finally resorted to pulling my phone out and sure enough, the sign had been turned around. On a side note, if you are an app developer and you build a mobile app for mapmyrun that allows someone to view a map while on their route and it doesn't display mileage, you're retarded. Back on course, I spent the next several miles meeting one free range dog after another. Very socially progressive, are the trailer living free range dog farmers of Oregon. I was never so happy to see Albany, to get away from dogs and be able to go to the bathroom!!! The 18 miles from Albany to Independence was loooooong. It was drizzling on and off for the first 15 miles, from mile 16 to 20 it poured pretty good. I changed shoes, socks and shirt at mile 20. I'll say it right now, I didn't eat enough. I went through 70 ounces of Infinit, half a peanut butter and jelly sandwich, 2 small boiled potatoes, 2 apple pieces and a handful of tortilla chips. If you're planning on running 45 miles I'd recommend eating more than that. That being said, I still threw up right after my clothes change at mile 20. I made it to Independence and mile 30 very tired but slightly ahead of schedule. Looking back I don't know how much of my doldrums was fatigue and how much was being intimidated by the hills to come. A 4 mile hill is tough at any time but mile 31 to 35 hit me pretty hard. I was dead on my feet by the top of the hill. on concrete, with bad sidewalks and driveways, but I did finish, 8:13, much harder without other runners around. Much harder with hills and rain. Once again, Jeanne was amazing road crew. Just the right amount of encouragement. I really don't like a lot of rah rah, which I know leaves someone feeling like there is very little they can do. She was perfect. She told me I needed to eat more, and she was right, but didn't argue with me when I refused. When I couldn't remember where I was going, even though I was running right through downtown Salem, where I've lived for 16 years, she patiently told me where to go. I only cried once, when Jeanne told me I had exactly 1 mile to go and I thought I was closer than that. oh.....and....yeah 45 miles with wet feet looks pretty ugly after.